Who does California’s new governor, Gavin Newsom, worship — the God of the Bible or himself? In these perilous days, I urge you to stand up for what’s good, right, and true, according to what the God of the Bible calls good, right, and true. You’ve got to fight for your standard of truth; otherwise “truth” is up for grabs. …but is also California’s inventor of homosexual “marriages,” and while he recognizes the humanity of babies in the womb, he still wants taxpayers to kill children in the womb? You call him a deceiver. When Jerry last took the oath of office, he reflected on a parable from the Sermon on the Mount. It tells of a foolish man who built his house on sand. A storm washed it away. But a wise man sought a sounder foundation. And when the floods came, and the winds blew and beat on the house he built, it did not fall. “For it was founded upon a rock.” For eight years, California has built a foundation of rock. Our job now is not to rest on that foundation. It is to build our house upon it. Did you notice that Gavin Newsom never mentioned Jesus Christ as the author of the parable? This is despite Jesus jealously affirming that His sermons were “sayings of Mine” in Matthew 7:24-26. And to claim that this sermon of the Savior of the world applies to California’s “rock” is quite a stretch. If California’s so stable as Newsom implies, why are longtime Californians leaving the state? What’s really going on is Newsom has rejected God’s Word but pretends that he hasn’t. Perhaps he hopes this “religious speech” will win the hearts of religious Californians. It didn’t for me. Newsom was baptized and reared in his father’s Roman Catholic faith. He describes himself as an “Irish Catholic rebel […] in some respects, but one that still has tremendous admiration for the Church and very strong faith”. When asked about the current state of the Catholic Church, he said the church was in crisis. 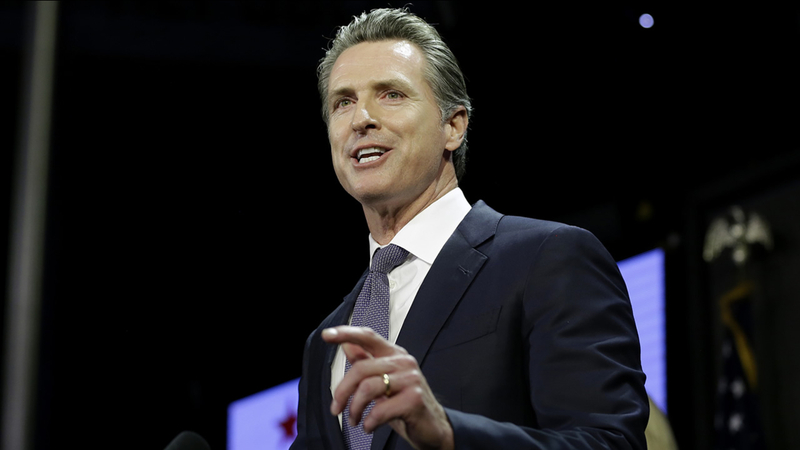 Newsom said he stays with the Church because of his “strong connection to a greater purpose, and […] higher being […]” Newsom identifies himself as a practicing Catholic, stating that he has a “strong sense of faith that is perennial: day in and day out”. So there you have it. Gavin Newsom’s public policies violate God’s word. And Newsom won’t publicly say Jesus or God. Perhaps he doesn’t want to attract the scrutiny of heaven. This entry was posted on Thursday, January 10, 2019 at 5:41 am	and is filed under Abortion, California Governor, Democrats, Fighting for what's right, Gavin Newsom, Jerry Brown, Jesus Christ, Meaning, SaveCalifornia.com. You can follow any responses to this entry through the RSS 2.0 feed. Both comments and pings are currently closed.